Our travels this week were dominated by Paraguay, a country that I will not soon forget. Thus far, this country takes the cake as our favorite, even though we only got to spend four days riding here. The friendly and curious people, variation in food (finally!! ), red clay roads, rolling hills, and dense forests made it perfect for a cycle tour. Despite warnings from others we met to avoid this place, I am so happy we made the call to roll through and wish we could have spent more time exploring this often skipped country in the region. For these "Route Recap" posts, from now on, we are going to be sticking to more nitty gritty details of the roads and have less commentary on the people we meet and the thoughts we have while traveling. We'll keep writing about those things separately, while route recaps will be best for those interested in the more "cycle-toury" details. 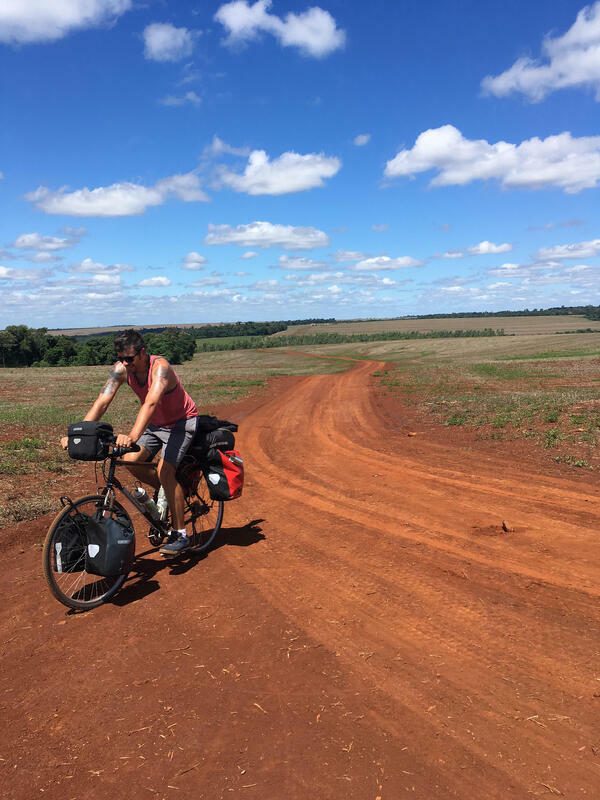 After two full days off the bike in Ita-Ibate, we felt well rested and overly excited for the prospect of reaching Iguazu by the weekend. So, we did what any other reasonable individual would do with fresh legs and high spirits: planned a 100 mile route for the day. We hadn't completed a century ride on this trip yet, and it was high time to get the first one under our feet. These 100 miles in Argentina were beautiful and we finally did not have a hair-raising, white-knuckled day with crazy drivers on the road. Scenery in the morning was dominated by a clear blue sky with picturesque, white, puffy clouds stretching out along the horizon. It felt like we were back to real cycle touring again! Considering we cycled 105 miles, the day was relatively painless and easy. We made it to Posadas, a town on the Parana River and bordering Paraguay, just as the sunset and checked into a hotel near the bridge border. 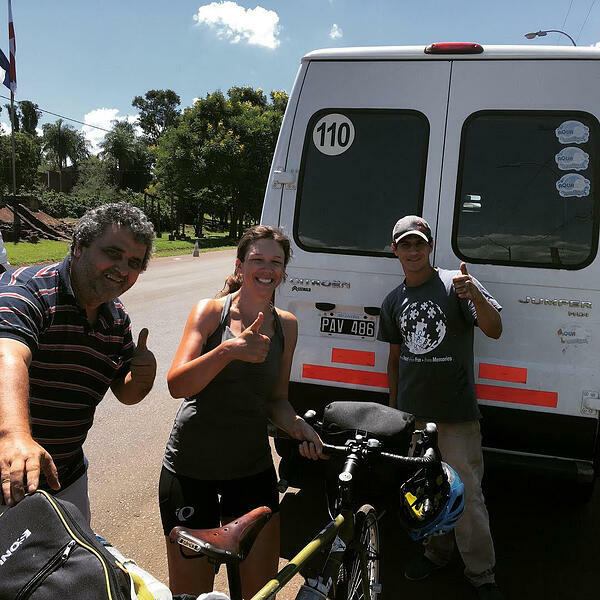 The next day, we took our time buying a few things in town, ate breakfast at a small French bakery, and made our way to the border and into Paraguay. Unfortunately, the bridge to Paraguay is not accessible by bike. This was initially a huge blow for us, but Suzie would not give up and coaxed the border agents to help find us a lift over into Encarnacion. It worked! 10 minutes later, we were in the back of a large van and heading to the third country of our adventure. Instantly the vibe felt and looked different. It's incredible how much the human-made concept of a "border" creates such stark variance within a few hundred yards. It reminded me so much of my time in Thailand: carts being pulled by vendors through the middle of the street, random vendors taking up every inch of sidewalk, the smell of burnt rubber mixed with chicken cooking on a spit... I loved every second of it. This felt a lot more like the South America I expected to experience from the start of the trip. The road conditions were much better than in Argentina. While the Route 6 is a busy thoroughfare, there's a wide shoulder to ride in giving us plenty of space between the traffic. We pushed through the heat of the day into the town of San Jose, where we heard about a great campsite on the edge of town. This was the best campground of the trip: there were two pools, flat ground, soft grass, clean bathrooms, and we had the entire place to ourselves! The next day was marked by continuous ups and downs along steep, rolling hills which made progress slow going. It was most difficult during the middle of the day when the sun beat down on us, but the lush green forests on either side of the road gave us lots to look at. Traffic was moderate, and the only times we felt unsafe was crossing bridges, as we lost the shoulder for those short sections. That night, as we had some issues with sleeping bags, we took refuge at a hotel off the side of the road. The next day was more of the same on the 6: constant ups and downs and relatively slow progress. For the entire route, we climbed over 10,000 feet! Due to the rolling nature, it didn't feel like it but makes sense why we were only able to cover 75 or so Kms each day. We did go off road for a short section to experience the famous red clay roads in this part of the country. Since it was hard packed, it made cycling really easy, but we still could not escape the climbing. That night, we stayed in Santa Rita and prepared to cross back over into Argentina. For the final day, we left the 6 and cut across farmland roads towards the border. These roads were far less hilly, so we made good time to the bustling metropolis of Ciudad del Este. The city is massive, and forms a mega-city with the neighboring Brazilian city Foz de Iguazu. Therefore, we planned to avoid the main bridge between the two and ferry across in the town of Presidente Franco. If you are traveling by bike or have the freedom of a car while crossing from Paraguay to Argentina, I highly recommend crossing using this ferry. It was quick and painless to get through border control. There were only two others on the boat, and it felt like a mini-tour of what was to come on the Iguazu River. 20 minutes later, we were back in Argentina and ready to go into tourist mode at Iguazu Falls.